Safe heating of 200L drums (steel and plastic) and 1000L IBC's, even in hazardous areas where ATEX or IECEx certification is required. Inteliheat jackets are constructed with custom elastomer and silicone coated glass cloth materials and high density fibreglass insulation. The heating medium uses a patented technology of carbon rich semi-conducting positive temperature coefficient membranes. Safe operating conditions are maintained even in the presence of potentially explosive gases. No transformers are required, operating using standard ac supply voltages. The InteliHeat is ideal for gentle warming and to avoid winter freezing. For faster heating rates and melting solids at higher temperatures, the Thermosafe Induction Heater is recommended for use with 200 litre mild steel drums. 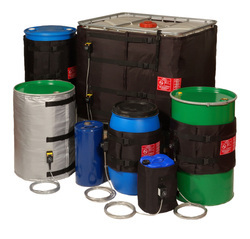 Inteliheat 200 litre heating jackets are designed and certified for use with plastic or steel drums. 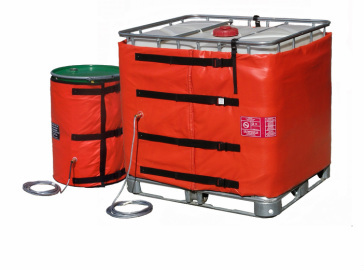 Inteliheat 1000 litre heating jackets are also certified for use around four standard drums on a pallet, with or without one of our insulated lids. This configuration is appropriate for the gentle warming of drums, or typically when viscosity problems are experienced only in winter. Email: Inteliheat@drumheating.com for further information or to find your local sales partner. Technical note: Some user specifications may request flame proof heaters or intrinsically safe heaters. These terms relate to specific technical standards applied to types of electrical equipment used in potentially explosive atmospheres. The standard used for the Inteliheat drum heater and IBC heater is IEC 600079:7 which is defined as "increased safety". The flameproof and instrinsic safety standards are alternate parts of the same IEC standard. All products in all these categories conform to the general standard IEC 60079:0 which forms the basis for the International standards used in IECEx testing around the world. If your application or project does not require certification for use in potentially explosive atmospheres, then we also design and manufacture an extensive range of standard and custom sized heating jackets. 50 litre (12 gallon), 100 litre (25 gallon), 210 litre (55 gallon), and pressurised gas bottles containers. If you have a custom size, then email our sales team with a photograph of the container, all dimensions, temperature requirements, and details of the material being heated and we will recommend an appropriate solution. All content in this site © LMK Thermosafe Ltd, 9-10 Moonhall Business Park, Helions Bumpstead Rd, Haverhill, Suffolk, CB9 7AA United Kingdom. Switch to our US site www.inteliheat.com for US contact details, or visit the contact us page on this site.